PLEASE NOTE THESE TIMES ARE ALL WEATHER DEPENDANT AND MAY CHANGE. ADMISSION:- ADULT £8.00, CHILDREN AND OAP.S £4.00. HIGHLAND DANCING ENQUIRIES TO:- MRS LINDSAY 01561340234. CLAY PIGEON SHOOT - FRIDAY 21ST JUNE - 6.00PM AT THE GAMES FIELD. 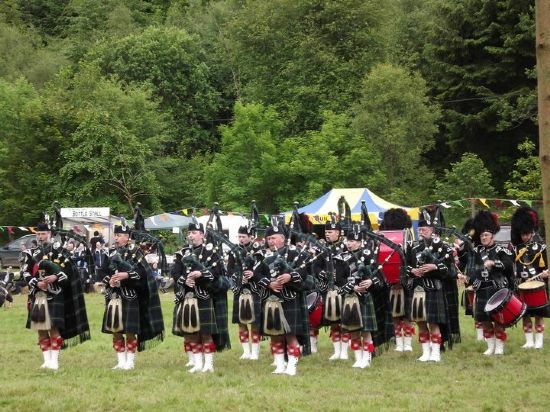 If it is the fourth Saturday in June it must be Auchenblae and the "Drumtochty Highland Games". This has been the tradition for over 30 years. Known as the friendliest Highland Games in the area they are firmly established in the Scottish Highland Games calendar as one of the most outstanding events. This is not only because of the top competitors attending and records broken but also for the all-round entertainment offered and the sheer beauty of the venue. Held in the grounds of Drumtochty Castle in Drumtochty Glen just 2 miles outside Auchenblae, any visitor will agree, there is no better place to be, on the fourth Saturday in June. Come and watch the athletes trying to break some more records. Lots of opportunities for young and not so young to join in on some open games. Make it a day out and enjoy the combination of exciting entertainment and nature at its best. If you want to watch some of the best athletes and have a fun day out, then come to the Drumtochty Highland Games,referred to as the most friendly Games in the area and do not forget to bring your camera with you.